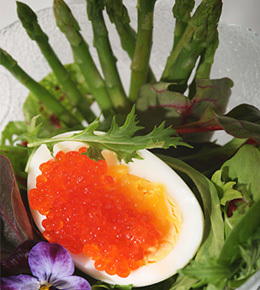 Eggs stuffed with ksalmon caviar is an exclusive dish: picturesque in its sight among appetizers it will be a delicious addition to your festive servings. Hard boil the eggs, clean of shells and cut the eggs into two equal halves when cooled. Place teaspoon-full of caviar on top of each egg half. Sprinkle lemon juice over washed and dried salad leafs. Toast bread slices and slightly butter them. Put one salad leaf on each toasted bread slice. Put 2 egg halves on each bread slice. Use lemon slices to decorate your dish. Better served with vodka or champagne.